Director-General Motojima was the operator during a pellet injection laboratory test. Also in the picture: US ITER Project Manager Ned Sauthoff; ITER Deputy Director-General Gary Johnson; and ORNL researchers Stephen Combs and Larry Baylor. 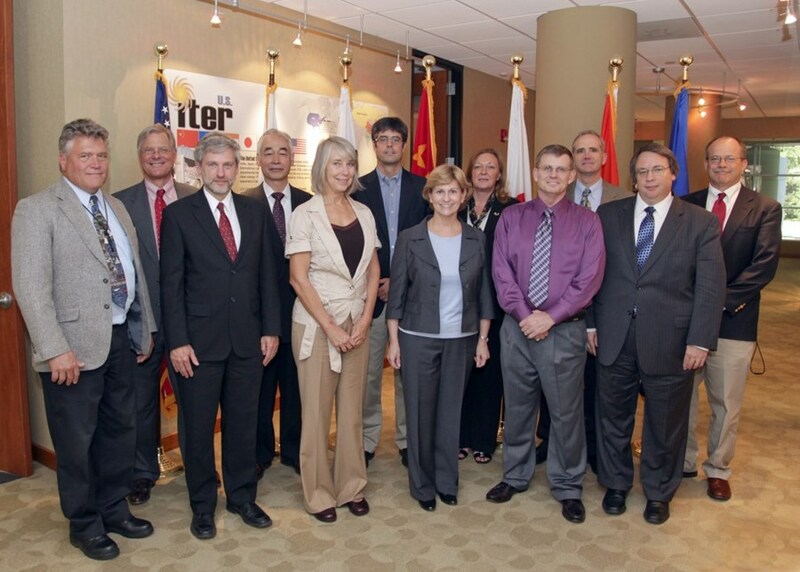 ITER Director-General Osamu Motojima and Acting Head of the Department for the ITER Project Gary Johnson visited the US ITER Project Office (USIPO) this week to meet staff members and update them on the status of the project. 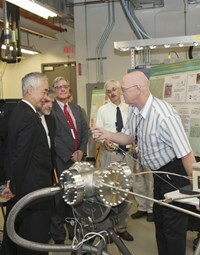 During their visit, Director-General Motojima and Acting Department Head Johnson (who is also Deputy Director-General for the Tokamak Directorate), held discussions with Oak Ridge National Laboratory (ORNL) Director Thom Mason and Michele Branton, Deputy Assistant Manager for Science, US Department of Energy (DOE), Oak Ridge. They also participated in a pellet injector laboratory test in which a pellet was shot through a mockup of a curved guide tube that will be used to deliver the frozen pellets into ITER plasmas for fuelling and controlling the plasma boundary. The visitors spoke with USIPO staff members during an all-hands meeting at the project office. In his welcome and introductions, US ITER Project Manager Ned Sauthoff pronounced it a "special day with very special visitors." Explaining that he has been a colleague of Director-General Motojima's for some 30 years, Sauthoff said that the new Director-General fulfills all of the qualifications for the position, with his experience in building large fusion devices and the resulting research operations and his demonstrated leadership in scientific research. Director-General Motojima expressed his pleasure in coming to the USIPO and meeting its staff members. He said he was happy to return to Oak Ridge, which he estimated that he had visited some 15 times during his previous research and management positions. For US ITER and ORNL members, Director-General Motojima is a familiar figure, having visited Oak Ridge more than 15 times. He then reviewed the ITER objectives and parameters and talked about the finalization of the Baseline during the Extraordinary ITER Council Meeting in July. He also discussed progress since the meeting—including the new management structure, establishment of the Project Board and the task force for cost containment, and beginning of the ITER construction phase—and stressed the importance of the ITER schedule. Director-General Motojima also reviewed the Action Plan and discussed issues related to cost and cost containment. 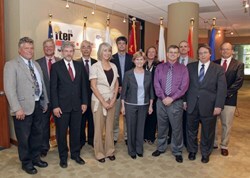 Acting Department Head Johnson greeted his former Oak Ridge co-workers and provided a briefing on the roles of the 32 US personnel who are members of the ITER Organization.